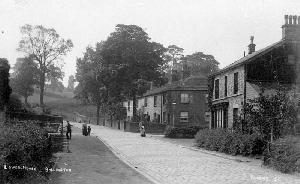 Moss Brow once called Hall Lane was the original road from the main route at Bollington Cross to Lowerhouse and it`s mill before Albert Road was built. At the Lowerhouse end (pictured) there is a delightful collection of stone cottages. At the far end of the terrace shown there is a path along the front of Long Row terrace. At the Bollington Cross end there are old stone cottages and a house on one side and more modern detached houses opposite. Approach off Albert Road or Bollington Road (very narrow). Leads to Moss Lane, Long Row. 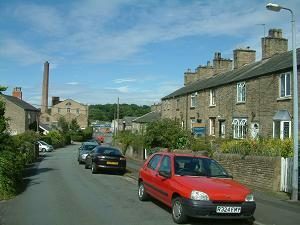 Nearest shops – West Bollington. Moss Brow is a very old country lane and that part of it which travels through fields is, other than the tarmac surface, very probably much as it was many hundreds of years ago, and the hedges are equally ancient. On an old map it is marked as Moss Lane and was probably part of the route that now includes Moss Brow and Moss Lane. The word brow would normally refer to the steep bit at the Bollington Cross end. See Brows. See Albert Road for an old map covering this area. 1 Moss Brow, The Corner Shop ; II, House with 17thC core.